Stephen Mansfield, Tokyo: A Biography. 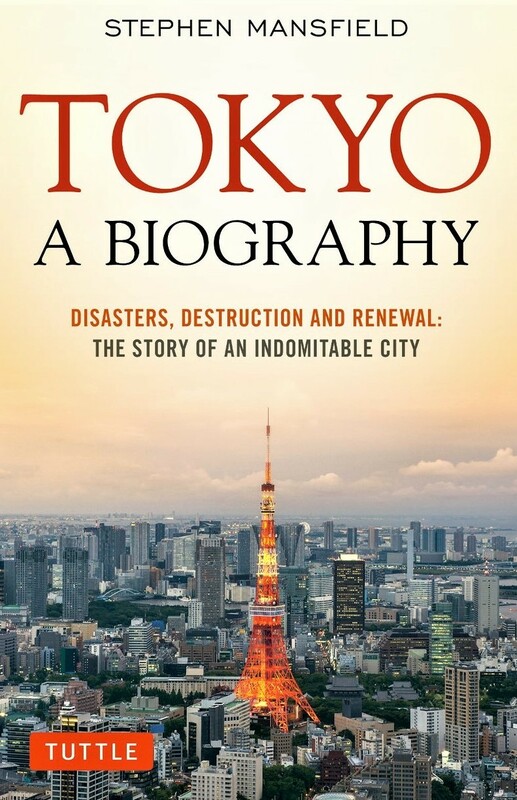 Disasters, Destruction and Renewal: The Story of an Indomitable City (Tokyo: Tuttle, 2016). “When you start to think of the past as happening, as opposed to having happened, a new way of conceiving history becomes possible . . . History is time travel.” (Page 8). I couldn’t agree more, as this is exactly how I approach the study of history and the future, which blend together: beyond a brief, flickering moment, there is no real present. Mansfield takes us quickly from prehistoric shell mounds (circa 3,000 B.C.) through the introduction of rice cultivation (300 B.C. – 300 A.D.), metalworking and the creation of formalized burial sites. “When people begin to honor their dead, they have made a significant leap in social development; the remembrance of ancestors is an important act in the establishing of historical time.” (Page 13). What is now Tokyo slowly took hold over the centuries. Strange things happened from time to time to keep it going. For example, on March 18, 628 A.D., “Hinokuma Takenari and his brother Hamanari, both fisherman, found a small gold statue of Kannon, the Goddess of Mercy, tangled in their nets . . .” Subsequently, a temple was built, still in existence. “The origin of the icon remains a mystery, but a possible explanation surfaced in 1945, just after the firebombing of the temple, when the remains of the main hall were excavated” and its possible Korean origins were ascertained. (Page 15). Edo (“door to the cove” or “bay-entrance”) becomes Tokyo (“east capital” or “eastern capital”), when it’s renamed in 1868. “. . . history preserved in names, sufficing for the absence of material evidence of the past, was to become a characteristic of a city thoroughly fixated on the present.” (Page 16). 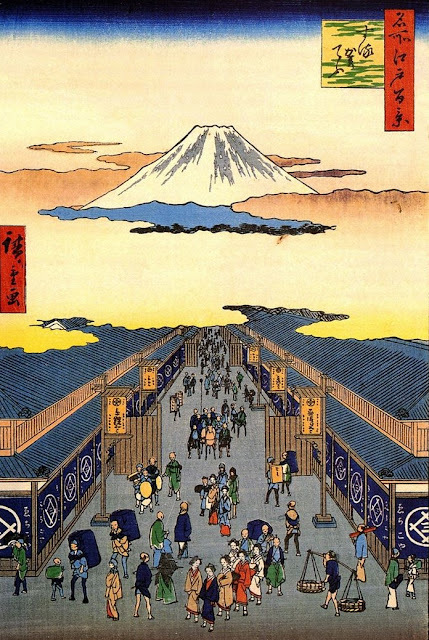 Before Tokyo, in the Edo period, during the mid-1400s(+): “Visiting poets, scribes and members of the literary nobility left short accounts of this first incarnation of the city, but no [physical] trace remains of its earth fortifications or structures.” (Page 19). Shoguns and emperors, feudal system. Geomancy (akin to feng shui) employed for city planning. (Page 24). Mount Fuji looms, though a hundred kilometers away. (Page 29). Fires, earthquakes, floods, and outbreaks were recurrent. Consider the Long Sleeves Fire of 1657 when two-thirds of the city was destroyed and one third of the population perished. (Pages 32-33). (Incidentally, the Great London Fire destroyed most of that smaller city in 1666). But the Floating World was soon back in action: the pleasure quarters, kabuki, and art: "the center of an alternative culture marked by decadent aestheticism and connoisseurship of taste that were depicted by some of the greatest artists of the city." (Page 39). 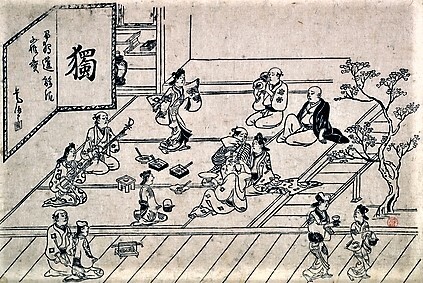 Books and book lenders expanded into the 19th century: "Little wonder that literacy levels in Edo ranked among the highest in the world . . ." (Page 41). And let's not forget the eccentric ways of the ruling classes, particularly under the shogun Tsunayoshi, who loved dogs. Under his edict: "Edo citizens were required to address dogs using the form O-ini sama (Honorable Mr. Dog)." (Page 43). 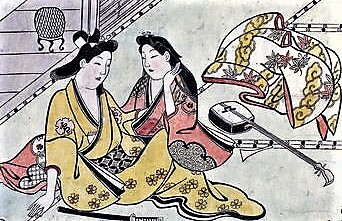 As for cuisine, the Japanese preferred rice and seafood and generally shunned land meat; when they did eat the latter, it was made more palatable by calling it "mountain whale." (Page 44). Edo, despite more big earthquakes and great fires, grew in population so that by 1700, it was "the most populous city in the world" (and still is, at the dawning of the 21st century, as Tokyo). As for the great disasters, clearly they were caused by the gigantic "earth spider," a "giant catfish" (page 45) or some other frightening creature: with them in mind, could Godzilla and Mothra of the atomic age be far off?